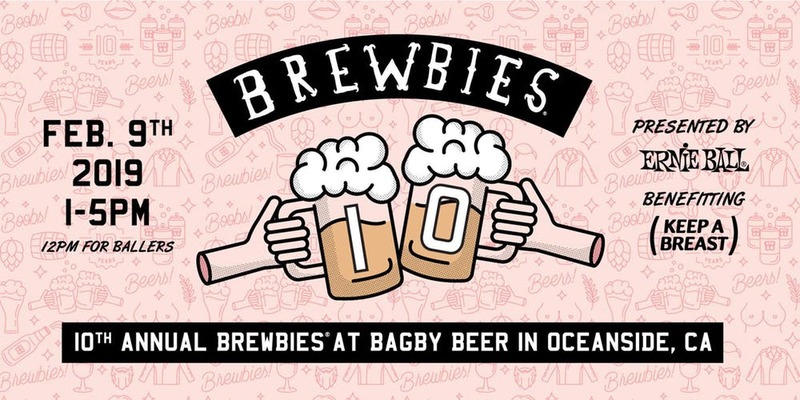 The 10th Annual Brewbies Festival, being held at Bagby Brewing Co. in Oceanside, raises money for the Keep A Breast Foundation. ListenSD chatted with Melanie Pierce, an organizer of the event, about the music scene and the importance of the festival. What have been the best additions/growth points of the festival over the last ten years? Over the last 10 years, its continually been amazing to see how many people come out for Brewbies; its growth over the years has always been astounding to me – attendee and brewer participation is always so sweet and humbling. The first 4 years of doing the festival at Pizza Port Carlsbad we averaged about 50 beers, and now, we’ve moved the festival to a much larger space at Bagby Beer Co. The brewery is located at Oceanside, and we have about 50 breweries onsite, food trucks, a giant raffle, and the Ernie Ball mobile stage with live music. Additionally, Brewers get super involved and create special pink beers for the Fest. Last year, we created our very own “Brewbies® Pink Beer Awards” to honor all those unique creations. We have a panel of judges do blind judging and award the Best Overall Pink Beer, and we also have a People’s choice, where attendees can vote on their favorite. In 2016, our friends at Faction Brewing brought us up to the bay area, where we hold Brewbies at their 30,000 sq. ft brewery overlooking the San Francisco skyline. How are the bands chosen? What’s the desired vibe at the festival? We pick bands that we listen to while we’re drinking cold beers. The vibe at the festival is really cool; it’s a special place that’s not your average “beer fest” vibe. People are there to support the cause, so having music to compliment that is what we aim for. We’ll be getting down to Ypsitucky, The Shane Shipley Band and Shake Before Us this year. Tommy Guerrero played at Brewbies in the Bay a few years ago, and he’s from Alameda – it was so cool. How does Brewbies, as an organization, link the various city events? Brewbies has always grown organically, we like to partner with like-minded people who are in it to do good, and it doesn’t hurt that all of the cities we’re in have great breweries! What’s your favorite part of the festivals? For me, it’s really about community. Sure, pink beer is cool, but is that really why people are coming together? We’re all there because, in one way or another, we’ve been affected by breast cancer. Brewbies is an excellent event to get involved, give back, and be a part of the community. Brewbies tickets are still available, and can be purchased here.